Prachi and her cousin come to the bus station as they are going to Delhi for further education. Her cousin is very excited but she notices that Prachi is upset. Prachi shares that she is going away from her mother after a long time so she is feeling upset. She remembers how Pragya cared for each and everything for her. Pragya is worried about Prachi as she is going to out of the station after a long time. Bijee asks her not to worry much as Prachi has grown up. Finally, Prachi and her cousin reach Delhi. Prachi recollects that Abhi is her father who stays in Delhi and because of him Pragya had to leave Delhi. Her cousin gets the address of her uncle but it flew with the wind. They run behind it. 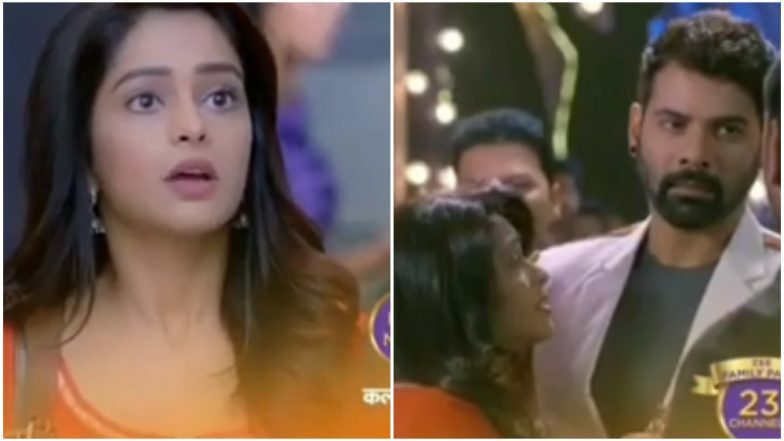 Kumkum Bhagya Leap: Not Kirtida Mistry But Mugdha Chaphekar Bags The Shabbir Ahluwalia-Sriti Jha Starrer! Abhi has a conversation with Rhea and he insists her to attend his award function. Rhea agrees to that. While Prachi looks for the paper of address, it flies on the road. Prachi tries to catch it but she comes in front of Abhi’s car. Abhi somehow manages to turn the staring and safeguards her. Prachi and her cousin get very scared about the incident. Pragya gets some intuition of something wrong happening with Prachi. So she gets tensed. Bijee consoles her. But Pragya feels that Prachi must be safe. She tries calling Prachi but her mobile is switched off and she gets even tenser. Abhi comes out to talk to Prachi. He scolds her for coming in front of his car. While Rhea is on the call, he sees Prachi. They look at each other and smile. Later Abhi asks her to think about her parents before doing anything wrong. Later he leaves from there. Prachi apologizes to him and also expresses her gratitude for saving her life. But her cousin is upset with the way Abhi scolded her as if he is her father. Prachi gets angry as she hates her father. Abhi shares the incidence with Rhea. Prachi and her cousin lose the paper of address. They come to get their bags, but they see someone stealing their bags.